As some of you, who know me in real life and who read the blog regularly, know, I *may* have planted a little bit too much turnip in the garden this year. I planted Purple Top White Globe variety because hello, purple. They are more radishy than the turnip I normally eat from the grocery store. I tried to make a couple of different things in hopes that (a) it would work for the blog and (b) use up some turnip. The attempt at Cajun seasoned baked turnip curly fries were just so-so, not blog-worthy. The scalloped turnip recipe I tried was okay, but I think it will be a whole lot better if I throw it in the Vitamix and call it a turnip bisque once it’s pureed to oblivion, and if I add some Sriracha (my homemade version of course). 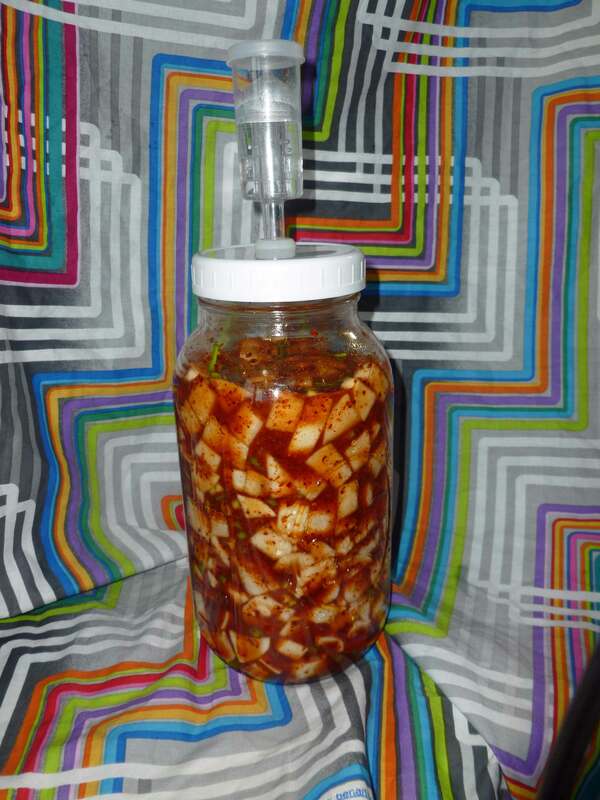 So since the turnip is radishy, I decided to make a version of cubed radish kimchee, which usually uses daikon radish. So if you can’t find fresh daikon in your area, get yourself some Purple Top White Globe turnips and go to town. I used this recipe as a starting point. If you do not like spicy/hot food, maybe pass on this recipe. If you need it to be vegan or you’re allergic to fish, you can sub out the fish sauce with soy sauce or a soy sauce substitute if you have issues with soy, or or you can just use some extra juice from the turnip mixture, as explained below. Normally, I do the step by step instructions with photos, but I have to go can a bunch of turnip in the pressure canner. So here’s some of the in-process photos, and the recipe card. 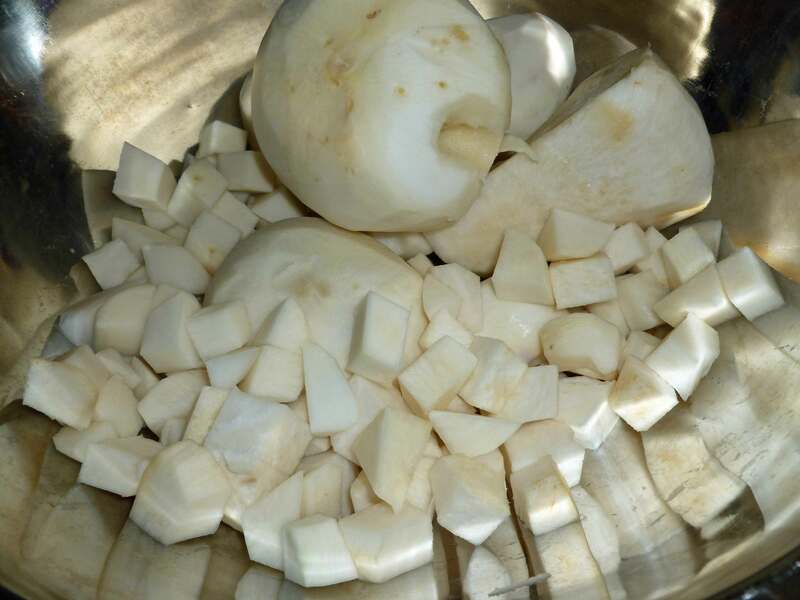 Peel turnips and rinse in cold water and pat dry. 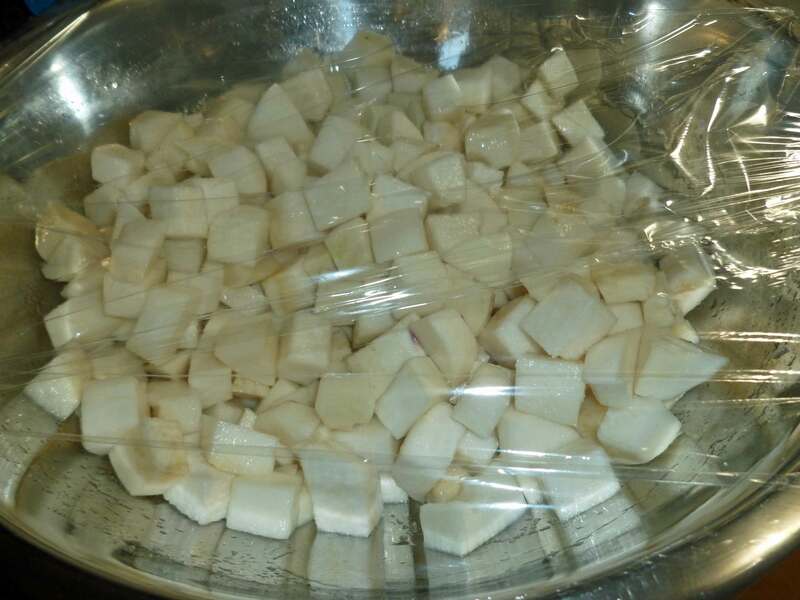 Cut the turnip into cubes about 3/4 of an inch. Place them in a large bowl. Sprinkle salt and sugar over the turnip and mix well. Place a cover or plastic wrap over the bowl and let it sit for 30 minutes. The salt and sugar will pull water out of the turnip. Once the 30 minutes is up, drain the juice from the turnip into a small bowl and set it aside. Leave the turnip cubes in the large bowl. 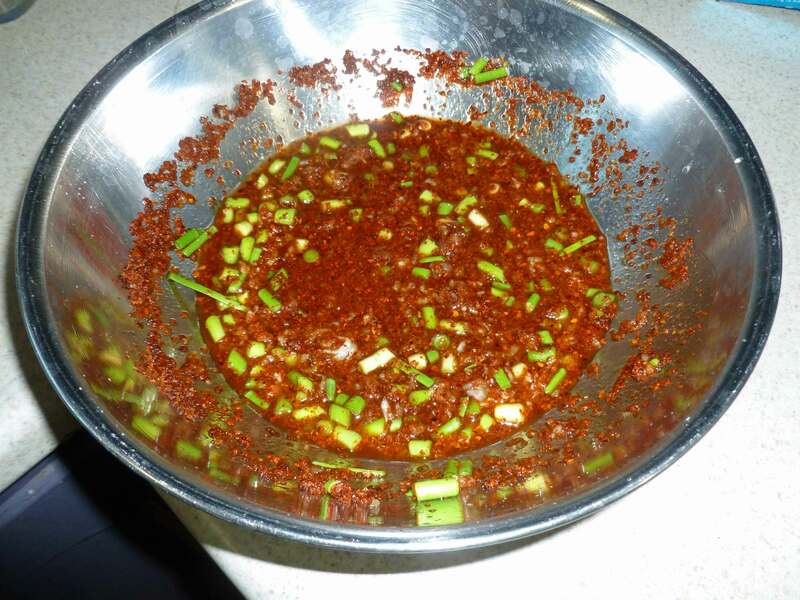 In another small bowl, add the minced garlic, the grated ginger, the chopped green onions, the fish sauce, the Korean red pepper flakes, and 1/3 of a cup of the drained turnip juice. Whisk these ingredients together until well combined. Pour Korean red pepper flake mixture over the turnip cubes in the large bowl, scraping the small bowl clean so that all the Korean red pepper flake mixture gets added to the turnips. 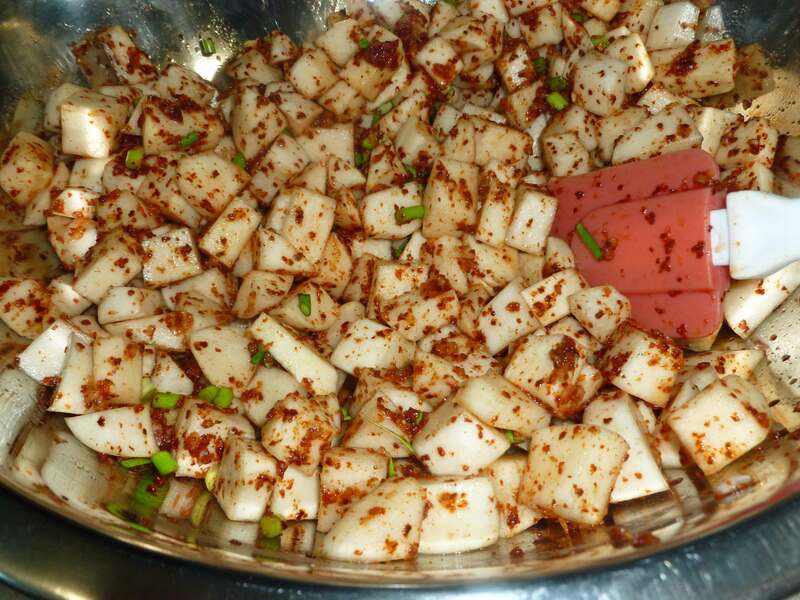 Mix the turnips and the Korean red pepper flake mixture well until the turnips are completely coated. 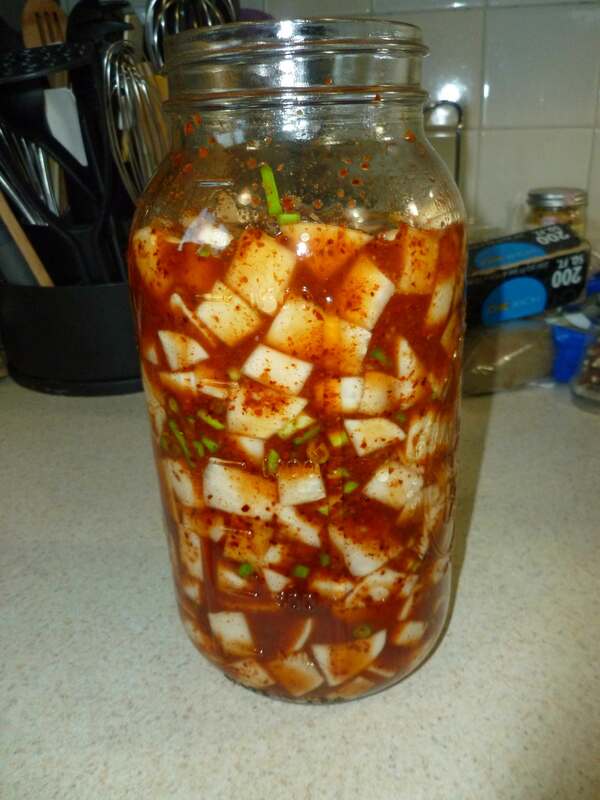 Put the turnip mixture into a glass jar (I used a half gallon Ball mason jar), making sure that you scrape the bowl clean and all the Korean red pepper flake mixture goes into the jar with the turnips. Use a spoon or a spatula to press down the cubes to remove any air between them. You can either place it in the refrigerator and eat it right away or you can let it ferment by leaving it outside of the refrigerator for a few days. I use an airlock with a plastic cap and silicone gasket, but you can use a lid if you just remember to open it (burp it) twice a day, so that the pressure doesn't build and the glass jar does not crack. When it starts fermenting, you may see little bubbles. After three to five days, store it in the refrigerator and enjoy.